2016 is a major milestone for a lot of classic television shows ... both BATMAN and STAR TREK debuted 50 years ago, as did DARK SHADOWS. And CHS contributor Wally Wingert is ready to tackle them all! He recently shot episodes devoted to BATMAN and DARK SHADOWS, which are set for release on the web sometime soon. Here's what he had to say over at his blog. "These are the most ambitious episodes we’ve shot so far. I wanted to make them a little more complex just to see how we’d handle the content as a crew, and see what our limits are. It went magnificently. Of course, the subject matter for the two shows was extremely close to my heart, so I wanted to make sure we did good shows. 2016 marks the 50th anniversary for 3 of my favorite TV shows of all time…”Batman,” “Dark Shadows” and “Star Trek.” We did the “Batman” and “Dark Shadows” episodes today, and we’ll do “Star Trek” and James Bond next." 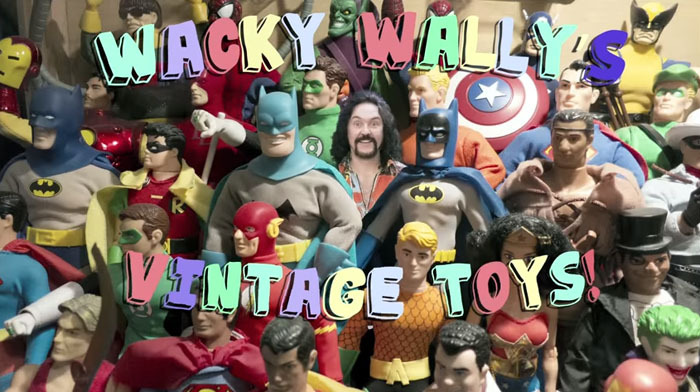 You can track WACKY WALLY'S VINTAGE TOYS on Youtube. Meanwhile, watch some behind-the-scenes video of last weekend's production below. I've never tried embedding a video from Facebook before, so you might have to "like" his page to get permission to see it. Which you should totally do anyway.